How do I reach the needs of all of my learners without leaving others behind that need more work in a specific skill? How do I build up a library of resources that I can pull from at any time that match the concepts and standards that I am teaching? How do I ENGAGE my students in activities that will keep them working within their Math Workshop groups so that I may work with small groups as well? How Do I Reach the Needs of My Learners with Middle School Math Workshop? As teachers we know that we need to teach our students using their learning styles, and while there are three main learning styles (visual, auditory and kinesthetic), more often than not our students need to be learning via a HANDS-ON, MINDS-ON style of learning. Hands-On, Minds-On Learning allows our students to interact with the concepts put in front of them in a meaningful way with activities that allow them to touch, feel, and hold while learning. 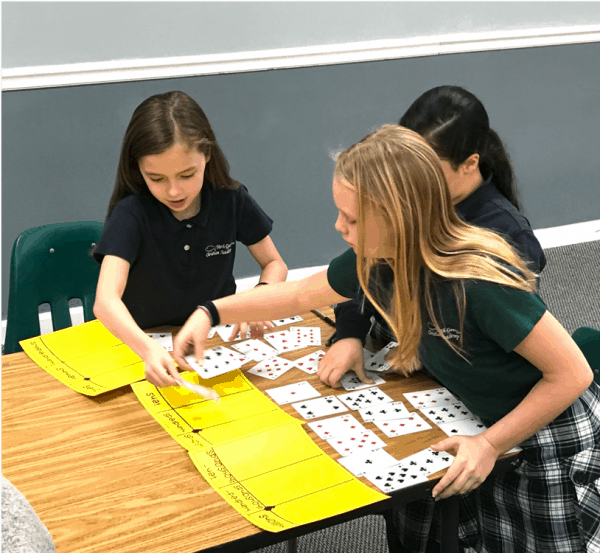 Each of the 192 activities within the Sixth Grade Middle School Math Workshop engages students hands and their minds to where they aren’t just sitting and getting the material. They are actually interacting with the concepts, interacting with one another and processing the skills to be able to apply them later on. Regardless of students learning style, our students will always learn best when they interact with activities that allow them to use multiple learning styles at once. How Do I Build Up a Library of Resources and How Do I Use Them? Hands-on activities, small group stations and variety of learning activities that are low-prep are the goals of all of these activities to not only benefit your students but also to allow you as the teacher to Work Smarter, Not Harder during your prep time. 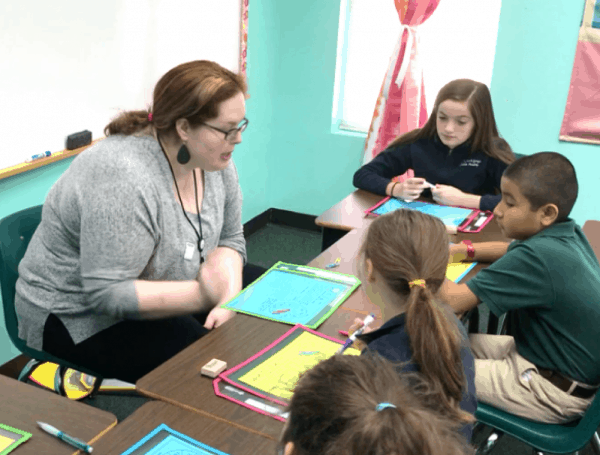 Over my decade of teaching, I started with using Math Workshop in the Elementary classroom and when I moved to Middle School I knew that it was a practice that I wanted to put into place because I knew it would work if I pushed through it. 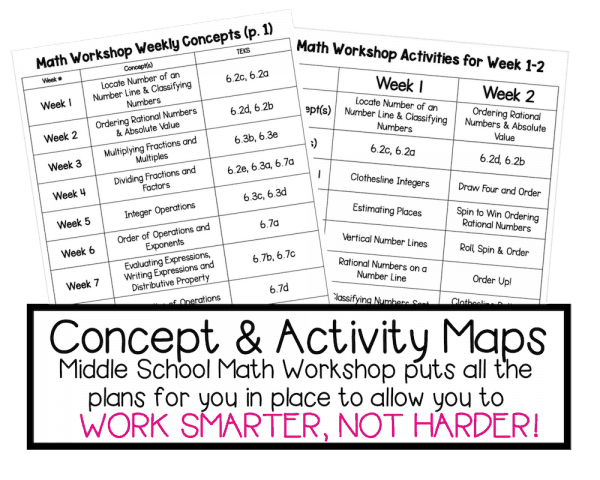 During the Summer of 2018, I wrote and published Establishing Math Workshop in the Middle Grades to go over all the nitty-gritty to show how I was able to implement Math Workshop on a regular basis. During this time I dreamt about many possibilities of the future and having all my Math Workshop activities prepped ahead of time and ready for my students and despite my best attempts, it was a struggle. Now that I have been working with teachers worldwide to implement Middle School Math Workshop over the past several years, I have made that dream a reality not only for me but for YOU! 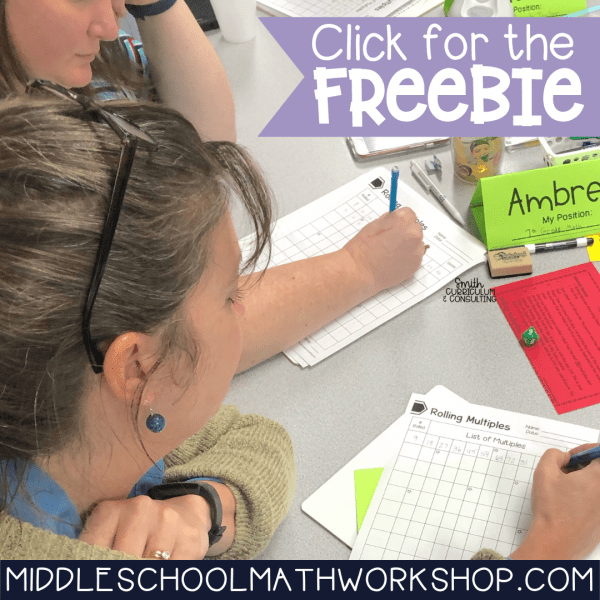 What Makes Middle School Math Workshop Different? First of all, I LOVE when my students are truly ENGAGED with their learning that the time passes them by and they don’t even realize it. It happens and it will happen for you! Busy work doesn’t have a place in the math classroom when there are so many concepts for students to not only learn each year but to review from previous grades. I know for one that I never had a class that was fully ready for the grade that they were in and I was stuck to fill in the gaps they needed from prior grades as well as build their foundation for the next grade. You can’t build knowledge on a rocky foundation! 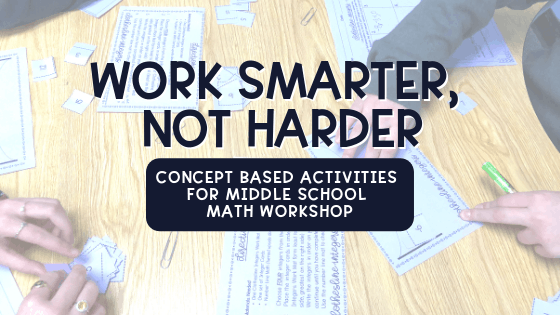 The activities that I have included within the Sixth Grade Math Workshop Activities are all brand new activities that are not included in any other way in Smith Curriculum and Consulting products. While some of them may be the same style they are all brand new, 100% so that you are not getting any crossover. Over the course of Middle School Math Workshop for Sixth Grade, there are a total of 192 activities broken down into 24 “weekly” units. I use the term “weekly” very loosely as you may use only half of the activities on one school week and therefore a weekly unit will actually last you two weeks in your classroom. This allows for true flexibility of the different length of time within math classrooms. Check out the Weekly Concepts and a Sample of the Workshop Activities for Week 1 through 4 to get a taste of what is included. And if that’s not enough, I would love for you try out a FREE ACTIVITY straight from Middle School Math Workshop. I want you to see what is involved and how these activities are perfect for your classroom. Will There Be Additional Materials Added? The cost for one teacher license* is $249 through May 7th at 11:59pm EST. This price is just for you and upon purchase, you will be given access to the current availability of materials. Further units will be released and you will be notified as soon as they are released. As of May 1st, there are 12 weeks of items included which is 96 activities. Make sure to view the Timeline to know the expected dates for future download updates. Jumping in on this introductory pricing can save you at least $100 per teacher as when the launch comes around again (and includes teacher training videos) the licensing will be $349 per teacher. Enrollment will not open again until August 2019. *A teacher license is needed for each teacher that will be using the resources to work with their students. Does this align with any specific curriculum? No, Middle School Math Workshop is not meant to align with any set of curriculum but rather to align with the standards and concepts within different grade levels. 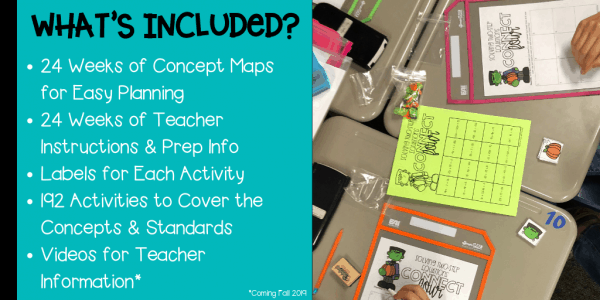 Look at the Concept Maps to see exactly which concepts are included in each grade level to know which is the right one for you. How is Middle School Math Workshop different that purchasing activities from your store here on your website or on TpT? Middle School Math Workshop includes completely new activities that are not found in my store separately. They will eventually be included by the weeks but not until much further down the line. What is the timeline for resources to be added? How will I know when to download them? The expected timeline for additional resources is a LIVE document and can be found here. It will be updated regularly as resources are added. What materials are needed to complete these activities other than making copies and possibly laminating and cutting them out? Materials are included in the Teacher Instructions and are limited to manipulatives that you have on hand or that are easily purchased through my Amazon Influencer Shop. How do I know if this will work with my students? This set of activities were designed to practice the concepts and standards at the specified grade levels. That being said they have also been tested in classes with feedback given by students and teachers before bringing the activities to fruition. I teach in a Common Core/non-Common Core state. How will these activities align to my standards? So happy that you asked! We are creating an alignment document to work for Common Core and Oklahoma Academic Standards and will have that out soon. If you are interested in seeing how your state aligns to Common Core, I would check out this book from Amazon for an easy bridge of standards. How much preparation will these activities take? Most of the activities are VERY low prep meaning copying, and possibly laminating and cutting to allow for use for multiple classes and years to come. Is this a membership or do I have forever access? No membership here! Once you own the product you own it. You will have access to updates to the files for as long as Smith Curriculum and Consulting, LLC remains in business. Can I buy this on Teachers Pay Teachers (TpT)? Not at this time and not for this price. Once all of the content is added for the activities then it will be on Teachers Pay Teachers at the respective price. Do you accept a purchase order? Can my school pay for this? Yes! We love purchase orders and will gladly help you work through that process. Just send us an email with what is requested from your school/district after completing a purchase and selecting Purchase Order at check out. Are you an approved vendor in my district or for my school? Send an email our way and we can see if we are. If we aren’t already an approved vendor, contact us and we can get started on the items needed to make that happen.